When creating a cleaning schedule for your cleaning services, you have to consider several things, including how often you want cleaning tasks to be performed, how long each cleaning task takes versus the amount of time your cleaner will be at your home for, and the areas that need cleaning more frequently than others. How often you need your cleaning service to come also depends on whether you live alone, whether there are children in the house, whether there is a pet, whether the people you are living with have allergies, and many other factors. So how do you come up with a proper schedule that suits your living arrangement? Before you schedule your cleaning service for specific tasks and intervals, it’s important to identify exactly what needs cleaning in your house. The master task list should take into consideration the cleaning chores for every room, including the living room, bedrooms, kitchen, bathroom, dining room, study room, and other partitions in your home. 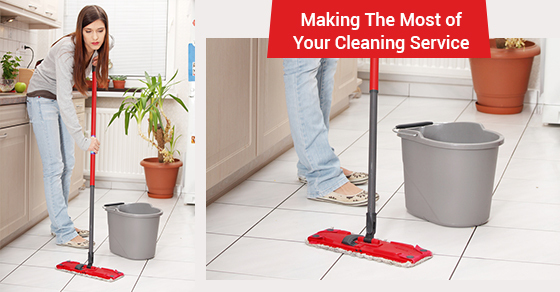 Once you have a list of all home activities, identify the sort of cleaning plan that you prefer. For instance, would you rather have a service clean a little every day, or to come on one single day to carry out all necessary cleaning activities? •Daily cleaning: This schedule is ideal for messy homes, possibly because of the little active children playing around. Here, you can allocate your cleaning service 1 – 1.5 hours of cleaning every day to get things in order, and dedicate one day to weekly cleaning tasks. •Timed sessions: This schedule also requires your service to perform cleaning tasks on a daily basis. However, the cleaning is progressive, so they can dedicate one hour (or some other specific period) to doing specific tasks. •One room/major task a day: This kind of cleaning plan requires your cleaning service to allocate different cleaning tasks to different days of the week. There is no limit to how much time they spend on that task, provided it gets done. Depending on the services they offer, it could be in the form of: laundry on Monday; Vacuuming on Tuesday; cleaning the bedrooms on Wednesday, and so on. •All cleaning in one day: This type of schedule is ideal for busy households, where you decide to do all cleaning on one specific day of the week. It could be because this is the day you’re out of the house or maybe it is the day your children are not home – so your crew can clean without much disturbance. At this point, you know what needs cleaning, and the cleaning plan that works best for you and your household. All that is left is to schedule your cleaning team, taking into consideration daily, weekly, monthly, and seasonal cleaning tasks. For more information on cleaning services and how they can benefit your lifestyle, contact Sunrise-Cleaning today!